You may not believe it, but one day it will happen! You will have to face drilling a hole in any surface. But you don’t know how to drill a hole. As a rule, no one pays enough attention to this. And all in vain! Do you know that improper drilling can cause cracking and stoppage of the whole project? Even though the drilling process seems simple, it’s almost a piece of jewelry. The used tools, the understanding of how to drill correctly are very important. In the end, literate drilling will save your time. How to achieve competent drilling? That’s what I intend to tell you in detail right now. Boring a hole and thinking about picking the right drill bit to do the job. The best way to choose the right drill bit is to consider the material you are working with. You can’t expect good drilling performance from your drill machine if you haven’t right drill bit for your work. There are many types of drill bit for different materials such as metal, masonry, plastics, wood, glass and tiles use specialized bits. Here is the video to choose the right drill bits. Check it out before start reading this big post. The High-Speed Steel bits are made of an alloy carbon steel, chrome, and vanadium. Working with iron, steel, brass, aluminum and copper require high drilling speeds. They can also be used on plastic and wood. But if the hole is large diameter or deep, the tip will become hot and the process, slower. The HSS bits come with an orange titanium coating that makes them harder and more durable, making them suitable for drilling harder materials like steel. Though eventually, the coating wears off when sharpened by hand. Instead, the solid cobalt alloy bits (HSS Co) are a good alternative for drilling mild steel and other metals. Due to the addition of cobalt, the bit can withstand higher temperatures without losing the edge. Only these are expensive and chip. Step bit also, known as the Uni bits these are conical in shape with multiple cutting edges of variable diameters. They can be used to drill laminates, particle board, plastic, softwoods and sheet metals. They are useful for drilling holes in electrical junction boxes, panels as one can drill holes of varying diameters without changing the bit. These bits are available in sizes – 6mm to 36 mm. The disadvantage of using them is that if you apply too much pressure, the wood splinters. Also, called the Brad Point bits these come in sizes of 3mm to 16mm. Used on timber they are also used on soft plastic as they do not melt the edges of the hole, unlike the HHS bits. If you are drilling holes larger than 1 inches, then this is the bit for you. These come with teeth like a handsaw, only they are fitted into a cylinder. They offer the torque and friction required to drill holes into wood or plastic. There are HSS versions that cut through steel, iron and other metals. These bits are used to drill holes through concrete, stone, and bricks. Their sizes vary from 5mm to 40mm. The masonry bits come with a rounded section shank. This allows for use in the conventional chucks. But an SDS type bit is a better choice as it does not slip in the chuck. It can also be fitted and removed quickly. They are used in percussion, hammer or impact drills. Their hammering or percussive action pulverizes the masonry in contact with the bit tip. These are like the hole saws the difference is that they are used to drill holes in aerated cement block and concrete. These bits are made of tungsten carbide that cuts through tiles and glass. While drilling, glass lay it flat on a soft cloth or newspaper for support. Spray the surface with water to cool and lubricate the bit then cut at medium speed. Also, called the coated tips they are used for drilling holes into glass and tiles. However, they have a short lifespan as the diamond grit wears off. If you are looking for the right tools for your DIY projects, then you might want to get yourself power drill set to help you out with your household repairs. Undoubtedly, a power drill is one of the most versatile tools available and just by changing the drill bits, you can drill through various materials like wood, plaster, pipes, metals or even tiles. 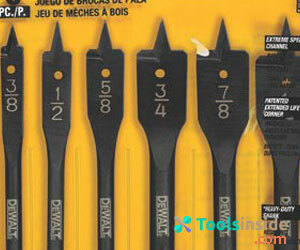 However, you should always select the right drill bits for each project and change it accordingly. But unfortunately, choosing the correct drill bit and changing it is something much easier said than done. If you are one of those who ever found yourself grappling with this, read on to find out how fun and easy this can be. Choosing a drill bit may be rather easy but changing it is a different ball game altogether. So how do you change a drill bit? – The answer depends on the type of drill you have. On a keyless drill, you have to loosen the chuck which holds the bit. By twisting the chuck counterclockwise, you can loosen the bit. Then the drill bit will start to wobble and you can pull out the bit without much effort. To set the bit, hold it with your thumb and index finger and insert it into the chuck with the smooth side facing the chuck. By holding the bit in one hand, squeeze the trigger to tighten the bit. For drills with a chuck key, line up the teeth so that they match on the chuck and then insert the tip on the side of the chuck. Turn the key counterclockwise to get the drill bit out and then put the new one in. Now turn the key clockwise to tighten the chuck jaws and this will firmly hold the bit in place. To check if everything is in place, run the drill without drilling a hole and if it is straight when it spins then you are good to go. When it comes to construction, metal is not the most malleable material. If you have a project that requires you to drill into metal, you might be overwhelmed at first. However, by using specific tools and a bit of expertise, you can be on your way with achieving fantastic results. 1. Choose a good power drill. This can vary, depending on the size of hole you want to make. With smaller holes, twist drills enable you to get the perfect measurement. This drill allows you to test the metal with a small hole and lets you work your way up to your desired size. 2. Pick out a professional drill bit for metal. Metal is a durable, unyielding material. Therefore, traditional drill bits would not be able to properly cut through it. Instead of using a regular drill bit for basic home repairs, choose a heavy-duty one. Titanium drill bits are usually best because they contain a titanium oxide coating. This allows them to cut through any metal, including metal sheeting. It also ensures long-lasting strength while you’re drilling. Cobalt drill bits are best for stainless steel. Also, check out step drill bits, which allow you to adjust the size of your hole as you drill. Since it offers several size options in one bit, you can skip the step of changing your bit to accommodate for a larger size hole. 3. Keep other tools nearby. This step is especially important if you want to err on the side of caution while you’re drilling. No matter what project you do, large or small, having safety equipment and other tools with you could help protect you from harm and save precious time. Consider using safety glasses and ear plugs if you are sensitive to sound and want to avoid getting small shards of metal in your eyes. If possible, have one clamp (or more) secure the metal you’re working with—especially for sheet metal. Also, a deburring tool might come in handy to provide a clean finish after you make the hole. Before start you should know drilling safety tips. The most critical part of drilling into metal is preparation. Be sure to establish where you want the hole and how large you want it to be. After you gear up with your safety equipment, line up your drill bit perpendicular to the metal you want to drill. Make sure your drill is at the correct spot where you would like the hole. Next, if you’re working with sheet metal, dimple the surface by using a center punch. This helps to guide your drill bit from accidentally slipping and puncturing the wrong area. Then, firmly grasp your drill and continue moving it with slight pressure. Stop when you’ve reached your desired depth. Finally, slowly remove your drill from the hole and turn off its power. Use your deburr tool of choice to create a smooth finish, and you’re done. As a whole, when you need to drill into metal, the process is not very complicated. The most challenging aspects include gathering the right equipment and planning for how you work, from beginning to end. If you just need to poke a hole in metal sheeting to fasten something, or you would like to embark on an involved project, taking a drill to metal is not as difficult as it seems. With your tools in hand and a patient demeanor, you can easily finish your project with the results you want. One of the reasons why it is so difficult to drill a stainless steel is its composition. Chromium is a metal used in the chrome of objects to make them stainless. Yes, it is the guilty element of the problem! This hardness creates friction and heat. As soon as the cutting edge of your tool gets glowing from the friction, it starts to melt! This is why tools dull fast when you are working with stainless steel. If you are thinking of doing some remodeling project, you will have to deal with this difficult material. In this article, we are going to teach you how to drill a stainless steel like a pro. Squirt bottle with water as a lubricant for your tools. 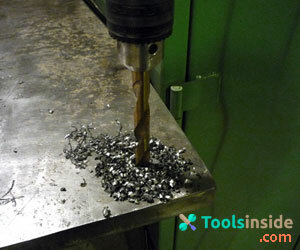 Drill bits for stainless steel: you can use a cheap one if you only plan to drill a few holes. Smaller diameter drill bit: they are perfect at starting the holes. 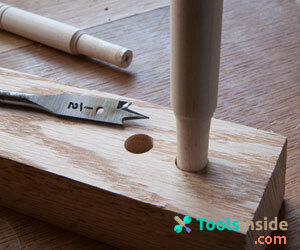 Center Punch: This will allow you to make a tiny dimple, which is key to a good start. Quarter inch drill bit to actually drill the stainless steel. Protective eye wear and shoes: to protect yourself from flying shards of hot steel. Now you are ready to drilling through using freshwater! Safety comes first! Put on your protective gear. Now, mark the location you plan to drill and please, check that you are marking the right place. Then, use the center punch to dimple your start. Next, put a little bit of water on your piece of stainless steel. You will see the steam coming off. This is an indication that the water is boiling. If you can have a helper who can keep a little squirt on there, will be good! It allows you to work without stopping. Everyone uses oil as a lubricant but this is a terrible mistake. Oil burns off relatively quickly and as soon as it is burning off, your tool will lose its cooling effect. Remember: heat is your enemy. The secret to success is using water to keep your tool always cool! Apply medium pressure to the drill but take it easy. Go on high-speed and harder at the same time is not an intelligent movement. You must be patient and ensure to reduce the friction. Drill at very low speed. This will keep your sharpness cool and it can last longer. If you run your metal drill bit too fast, you will heat the surface to the point of melting. Of course, it is all about balance. The trick here is practice. You will find a happy medium at which the drill, the bit, and the metal cooperate fully and everything will be so easy. Keep working on this way, slowly and steadily. Be sure to lubricate the bit and the hole. When you have achieved the hole size, you must check it. Make sure it has the appropriate size. You can use sandpaper to round it out and finish it off as a professional. Finally, enjoy your results! If you follow these tips, you will be able to drill a stainless steel without any problem. You do not need a high-speed tungsten drill bits to achieve this. You can pay a fortune for fancy tools but do not waste your money. With an ordinary cheap drill, you will be able to drill like a pro. Drilling a stainless steel is no mean task but with the right equipment and skills, the process can be achieved sooner than you possibly can imagine. When you need to drill into concrete, the process can seem daunting. After all, concrete is not the most forgiving material. However, with the right tools and correct timing, you can produce the results of a construction pro. Step #1: Find the best corded drill or cordless drill. First, you must consider the size of hole you want to make. 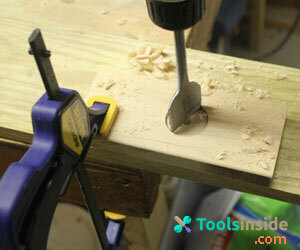 With small, shallow holes, you could simply use a handheld drill. If the concrete slab has a hole you need to make bigger, you’ll need a rotary hammer or hammer drill. Hammer drills are reserved for lighter jobs. Rotary hammers can tackle larger holes in concrete due to their many attachments. Step #2: Choose the correct drill bit. This is essential for determining the size of your hole. Masonry bits are perfect for concrete. In the same way, stainless steel drill bits are best for steel and metal drill bits for metal surfaces. Do not make the rookie mistake of putting a lot of pressure on a thinner drill bit. The excess pressure and force could potentially cause cracks in the concrete a costly repair. Instead, measure the diameter of the hole you want, and choose your drill bit accordingly. A bull point chisel bit works well for rotary hammers that need to start holes in larger concrete jobs. Step #3: Remember other essentials. Of course, this could vary from person to person and job to job. However, gathering safety tools and other equipment could prevent injuries and save valuable time. A dust mask, safety glasses, and ear plugs might be important for individuals who are more sensitive to the elements. Also, consider using a chalk or pencil, masking tape, and an air compressor to make the job easier. Always be sure to let concrete cure for three days before attacking it with a drill. If you’re securing anything to the concrete, it’s best to wait seven days. Assuming you are going to be working with set concrete, you can prepare for drilling. First, put on whatever safety equipment you would like to use. The dusk mask and safety glasses help protect you from the debris, while ear plugs eliminate loud noise. Then, place an “X” or other visible marking on the spot where you would like to drill the hole. This can be done with your chalk, pencil, or masking tape. Also, determine how deep you want the hole to be. Using your masking tape, wrap a piece around your drill bit to indicate when you should stop drilling. Next, firmly grasp the drill and set its power on the lowest speed. Station the drill to be perpendicular with the concrete slab, and begin drilling slowly. Once you’re confident with the hole you started, change the drill’s power to high speed and move steadily. Finally, stop drilling when you get to your desired depth. Remove any excess concrete dust or surrounding debris with the air compressor, and you’re finished. All in all, when you want to drill into concrete, the task is fairly simple. You merely need the right equipment for the project and patience to properly prepare. Whether it’s a small hole in a concrete wall, or large punctures in slab, you will be able to apply these master drilling techniques to yield your ideal finished product. Drilling a hole in glass does require some talent. One wrong move and you’ll be shattering your hard work (LITERALLY!). But fortunately, for DIY newbies like us, talent can be procured. Follow this small yet efficient guide on how to drill a hole into the glass and learn this noble skill some people spend years of training to acquire. A drill bit (Either a diamond-tipped or a spear-tipped carbide drill). Avoid stainless steel drill bits or metal drill bits. Let’s check first below video to learn how to conquer the art of glass drilling. Safety comes first – for both you and the glass. For the glass, secure it by laying the pane on a pad or other cushioning material. However, if you are working on a glass bottle, it’s better to work the object at an angle. It will help you drill the hole precisely. Remember not to wear loose clothing or dangling accessories while drilling. These items put you at a risk of getting caught in the power tool. Also, remember to put on protective goggles during the drilling process. Note: Don’t drill tempered glass. The glass tends to shatter upon contact with the drill and may pose a serious safety concern to you. You can easily spot a tempered glass by looking at its four corners. If the glass is tempered, the manufacturer is supposed to etch the glass at each of the corners. Using two pieces of masking tape, make an “X” on the glass where you have to drill. Now with the help of a felt-tip marker, make a spot in the center of the “X”. It will help you detect the exact spot where the hole has to be. Now comes the fun part – drilling! Insert the spear-tipped carbide or diamond-tipped bit into the power drill. Now, hold the drill at a right angle to the object’s surface. Start drilling at a low speed. Remember not to place too much pressure on the glass. Press too hard and it will crack. Once you have successfully carved the starter hole, remove the tape. Note: Use a smaller bit when creating a dimple or a starter hole in the glass. Replace the starter bit with a larger one if you want a wider hole than the dimple. Once replaced, resume the drilling at a slow speed – 400 rpm. Don’t fasten the process and start drilling at a high-speed as it can even ruin the bit. Hurrying the process may overheat the glass, triggering more glass-powder buildup and ultimately will shatter the glass. Add a coolant (generally water) on the drill bit to keep it cool and lubricated. Once the final hole is done, you will notice that they are sharper than the entry hole. Gently file down any glass build-up or the chips with the diamond file. Finally, rinse the glass to remove all the residuals. And voila! You can now drill a hole in the glass. Drill a hole into a glass is not tough task. But you have to give full attention and concentration while glass drilling. Choose a right drill and drill bits is another important matter. Follow our step by step guide to drill a hole into glass effectively. When you are working on home improvements and DIY projects there are some really annoying problems that can easily be solved. Drill a hole into tile is One of these headaches. Generally this is a task faced with bathrooms and kitchens. Getting it wrong means a broken tile or unsightly cracks. This means you replace the tile only to face the same problem again. Here is a Step by Step Guide to drill a hole through tiles without breaking it. This guide will assist you in avoiding costly mistakes and assist you to drill a hole in a tile. Tiles come in a range of styles and material types. The drilling process is different depending on the material the tile is made from. The hardest tile to drill is the porcelain tile as it is very hard but also brittle. To choose a right drill bit is your 1st important step. Different drill bits are perfect for different types of surface. Some drill bits are perfect for stainless steel, some drill bits best for metal. The easiest way to cover all tiles types is to get a diamond tipped drill bit. It costs a little more than a masonry bit. People who do not know if a tile is porcelain or not will avoid making a mistake. The diamond bit will last a long time and drill any tile. Make sure you have safety goggles, pieces of tile are very sharp and can splinter. Make sure the diamond drill bit you are going to use is the correct size. Sizing is easy as it is marked on the shank of the drill. Make sure the screw anchor is also the correct size so that it fits easily into the hole. This step is really important, you will need to measure precisely where your hole will go. However get the rough location first and then put tape over the location in a cross. Then remark precisely for the center of the hole. The tape will stop the drill bit slipping and cut down the tile fragmentation. If you have a variable speed setting on your drill then set it to 300 RPM. If not then set it to the low speed (all drills will at least have high and low). Ensure that the hammer action is NOT enabled. Place your drill on the pencil mark and squeeze the drill trigger. Use even pressure and let the drill do the work. Special Tips: – If the tile is ceramic or porcelain or if you are drilling multiple holes then keep a small pot of olive oil handy. Periodically stop drilling and dip the tip of your drill bit into the olive oil. This will help preserve the drill bit and cool it too. Once the hole has been drilled insert the screw anchor or rawl plug. Do not over-tighten your screw. Use screws that have a smooth shank at the top. A smooth shank will avoid expansion of the screw anchor in the tile itself. Expansion here can still cause a crack in the tile. Whether you use a cordless screwdriver or a traditional screwdriver it is important to avoid slipping of the screw head. This will damage the tile and put unsightly dark grey lines across the surface. These lines cannot be removed and so the appearance of your tile will be ruined. The guide above will allow you to easily and safely drill tiles again and again. Remember the use of safety equipment and a diamond drill bit will ensure you will get it right without damage to you or the tile. It can be quite daunting when you first use a spade bit. In fact drilling with a spade bit can lead to DIY disasters. This is especially so if the spade bit ‘walks’ across your pristine wood fascia for example. The best way to drill large holes with a spade bit is to follow the steps below. This step by step guide should help you avoid problems however it will take practice to master large holes. Right size and right type bit is the first important point. Because there are some bits for steel and some bits for metal. So ensure that the spade bit is the correct size. Important because as once you have drilled the hole too small making it bigger is very difficult. Also consider a small wood drilling bit as it can help to have a pilot hole drilled. Safety goggles are a must as debris can fly some distance with a spade bit. Some spade bits have a small hook at the outside edge of the blade and this will give a cleaner overall cut. The drill type is not too crucial as usually you will be drilling into softer materials such as wood and plastic. Therefore a corded drill will do the job without problem. Make sure that the spade bit is securely tightened. There is a lot of vibration when drilling like this and so a loose chuck grip can lead to the drill bit oscillating or wobbling. Depending on the material it may pay to use a marker pen rather than a pencil. It is common to have to drill large holes in plastic for example. Make sure that the center of the hole though is clearly marked. If you are drilling into a loose item then make sure it is firmly clamped to a bench. The spade end is notorious for ‘flinging’ lighter items. This is especially common on the break out part as the drill passes through the other side. Drilling should be controlled and if possible start slowly so you score the full circumference of the hole before applying more pressure. Locate the point of the drill either on your mark or the pilot hole. Keep the drill straight at 90 degrees as an off-center hole is a real problem. With steady pressure allow the drill to do the work. A firm grip will stop the drill from oscillating. If the drill oscillates too much you will end up with an elliptical hole which cannot be remedied. It is a really good idea to drill a small pilot hole. Even for spade bits that have the pointed tip. The pilot hole enables you to turn the item you are drilling over before you break through. Then locate the drill into the pilot hole and finish the drilling from the other side. Makes the hole neat on both sides. Alternatively you may be able to clamp a piece of waste wood to the back. This will ensure that your break through with no damage to the bit you need. Many peoples love to use spade drill bit to drill large. Using this process should allow you to drill with confidence. The end product should be accurate and neat. You should have had a safe drilling exercise too. Drilling with a spade bit always leave a bit of a rough end on the breakout side due to splinters. To remedy this use some medium grade sandpaper to smooth the rim. This will ensure no nasty splinters find your hands afterwards when handling. But a drill, bits, surface – it is not enough for the successful drilling a hole in any surface without cracks. At a minimum, you must be organized, and your workplace should be free from confusion. All tools should be at hand, and you must clearly represent what you are doing. Catch a working constructive spirit and go conquer any surfaces! And if you need help, read my advice once again and do it 100%.